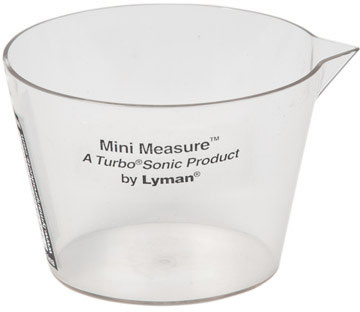 The Lyman Turbo Sonic Mini Measure Measuring Cup is the perfect accessory for mixing concentrated cleaning solutions for use in ultra sonic cleaners. The Mini Measure has graduations up to 2 ounces or 40 ml. Mixing the perfect amounts of cleaners is an easy job with the use of this measuring cup.